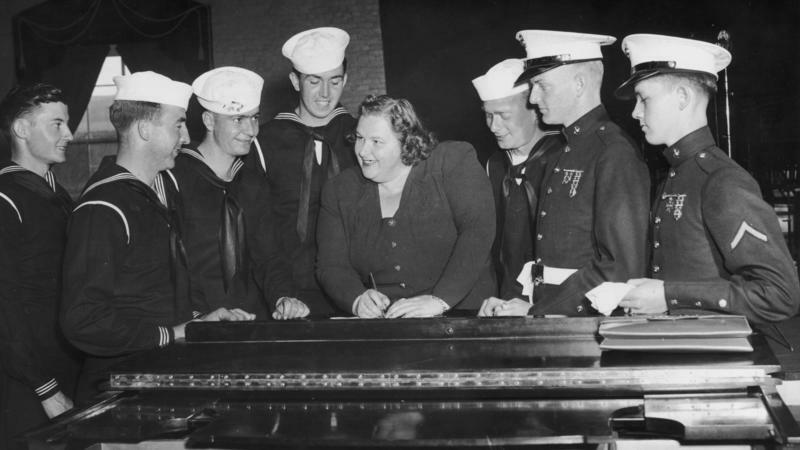 The singer Kate Smith's recording of "God Bless America" has been a cherished part of sports tradition in the U.S. for decades. But in the aftermath of a discovery that the singer had also recorded at least two songs with racist content in the 1930s, two major American sports teams, baseball's New York Yankees and hockey's Philadelphia Flyers, have announced that they will stop playing Smith's rendition of the Irving Berlin patriotic classic. On Sunday, the Flyers also took down a statue of Smith that had stood in front of their stadium since 1987. Springfield, IL – MINIMUM-WAGE WORKERS IN ILLINOIS ARE RECEIVING A $0.25 HOURLY BOOST IN PAY, TO $7.75 PER HOUR. STATE OFFICIALS SAY THE INCREASE WILL MEAN $520 MORE PER YEAR FOR 650,000 WORKERS. IT IS THE SECOND IN A FOUR-STEP HIKE IN WAGES ADOPTED BY THE GENERAL ASSEMBLY AND GOVERNOR ROD BLAGOJEVICH IN 2006. THE FINAL STEPS INCREASE THE WAGE TO $8.00 NEXT JULY AND $8.25 IN JULY 2010. ILLINOIS' PAY RATE IS NEARLY TWO DOLLARS HIGHER THAN THE FEDERAL STANDARD. Jackson County, IL – Three people were injured in a three vehicle crash near the Jackson-Union county line. The Jackson County Sheriff's Department says the accident occurred at 7:44 this morning on Route 51 about two-tenths of a mile north of the Union County line. Deputies say 17-year-old Joshua Poole of Jonesboro was driving north on Route 51, when his vehicle crossed into the southbound lane and collided head-on with 48-year-old Shiowyun Shih of Carbondale. ILLINOIS' AVERAGE PRICE FOR GASOLINE IS NOW WELL OVER FOUR DOLLARS A GALLON. SPECULATION IS GROWING THAT SEVERAL ILLINOIS DEMOCRATS AND REPUBLICANS ARE ANXIOUS TO THROW THEIR HATS INTO THE RING FOR GOVERNOR IN 20-10. ILLINOIS STATE SENATOR CHRISTINE RADOGNO [ROW-DOUGH-NYO] IS NOW ONE OF SEVERAL REPUBLICANS EYEING THE GOVERNOR'S SEAT IN 20-10. Springfield, IL – ILLINOIS STATE SENATOR CHRISTINE RADOGNO [ROW-DOUGH-NYO] IS NOW ONE OF SEVERAL REPUBLICANS EYEING THE GOVERNOR'S SEAT IN 20-10. SHE SAYS DEMOCRATIC CONTROL OF STATE POLITICS HAS LEFT A FISCAL MESS SHE'S COMPELLED TO CLEAN UP. BUT RADOGNO SAYS THE BIGGEST OBSTACLE TO A BID MAY COME FROM HER OWN PARTY. RADOGNO HAS REPRESENTED PART OF THE SOUTHWESTERN SUBURBS IN THE ILLINOIS SENATE SINCE 1997. SHE SAYS SHE WON'T MAKE A FIRM DECISION ABOUT RUNNING UNTIL THE 2008 ELECTION IS OVER. WITH THE HIGH FUEL PRICES, SOME PEOPLE ARE CUTTING BACK ON THEIR SUMMER TRAVELING, BUT CAMPERS STILL PACKED THE DUQUOIN STATE FAIRGROUNDS THIS WEEK FOR THE ANNUAL NEWMAR RALLY. THREE PEOPLE WERE INJURED IN A THREE VEHICLE CRASH NEAR THE JACKSON-UNION COUNTY LINE. GOVERNOR BLAGOJEVICH IS PUSHING A NEW YOUTH JOBS PROGRAM. Springfield, IL – GOVERNOR BLAGOJEVICH ANNOUNCED TODAY (YESTERDAY) A YOUTH JOBS PROGRAM. 10-THOUSAND SUMMER JOBS HAVE BEEN CREATED FOR TEENS AND YOUNG ADULTS THROUGH THE ILLINOIS DEPARTMENT OF HUMAN SERVICES AND DEPARTMENT OF TRANSPORTATION. THE LONGSTANDING, LIGHTHEARTED FEUD BETWEEN ACTOR/COMEDIAN STEVE MARTIN AND THE CITY OF TERRE HAUTE INDIANA IS THE SUBJECT OF AN UPCOMING DOCUMENTARY. Terre Haute, IN – THE CITY OF TERRE HAUTE INDIANA IS THE SUBJECT OF AN UPCOMING DOCUMENTARY. Springfield, IL – The grandstand concert lineup for the 2008 Du Quoin State Fair is out. Country singer and 2006 American Idol finalist Kellie Pickler will headline the show on August 27th. The following night it's veteran country group Sawyer Brown. Rock group P-O-D will take to the stage on August 29th and High School Musical star Corbin Bleu on August 30th. The Du Quoin State Fair runs from August 22nd through September 1st. Nominate someone in your hometown for a 'Good Neighbor' Award. SIU, SEMO, JALC Join for Verdi's "Requiem"